NASA is embracing small satellites for future Earth science missions. NASA plans to launch a suite of tiny, next-generation satellites into Earth's orbit to study weather patterns and climate change. 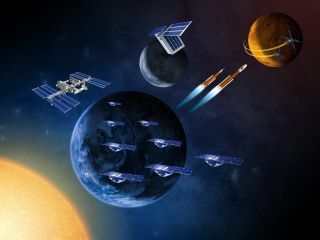 These missions will conduct important scientific research while also advancing the technology needed to launch smaller, cheaper satellites, NASA said. The space agency hosted a teleconference today (Nov. 7) from its headquarters in Washington, D.C., to discuss some of the new small satellites, or "smallsats," that will launch in the coming months. Ellen Stofan, chief scientist at NASA Headquarters, explained that small satellites can reduce the costs of space-based Earth observations. Additionally, the satellites can increase access to space for private companies as well as universities and students interested in pursuing science experiments in Earth's orbit, Stofan said. "Small satellites have several advantages," he said during the teleconference. "They reduce the risk and cost of demonstrating precursor technologies and infusing them into larger flight projects. They're used for flight testing and demonstrating new proof-of-concept components. And they enable affordable distributive science observation systems using constellations or swarms of small satellites to achieve broad coverage." For example, eight identical spacecraft in NASA's Cyclone Global Navigation Satellite System (CYGNSS) mission slated to launch Dec. 12 will fly in formation over the Earth's most hurricane-prone latitudes to monitor the weather and improve storm-forecasting capabilities. All eight CYGNSS observatories prepped for launch on the Pegasus rocket. Another mission, the Radiometer Assessment using Vertically Aligned Nanotubes (RAVAN) project, aims to encompass the globe with several orbiting satellites that will monitor the greenhouse gas effect and Earth's changing climate. The first RAVAN is a three-unit CubeSat, or mini satellite, scheduled to launch later this month, said Bill Swartz, the mission's principal investigator. If all goes well, RAVAN satellites may someday swarm around the entire planet. A planned constellation of multiple RAVAN (Radiometer Assessment using VerticallyAligned Nanotubes) satellites would be evenly distributed around planet Earth to measure energy balances in the global atmosphere and monitor climate change. In a separate mission, a swarm of 12 CubeSats will study tropical cyclones while also measuring and tracking air pollution. This mission is called TROPICS, short for Time-Resolved Observations of Precipitation structure and storm Intensity with a Constellation of Smallsats. Each satellite will use a radiometer instrument to measure temperature and water vapor profiles of storms. William Blackwell, the principal investigator for TROPICS, said during the teleconference that the satellites are about the size of a milk carton and weigh about 8 lbs. (3.6 kilograms) each. With 12 individual CubeSats, the TROPICS constellation of small satellites will fly over any part of the tropics about every 30 minutes. This will allow the mission to monitor the quickly changing features of tropical cyclones as they progress. Each TROPICS CubeSat is the size of a loaf of bread and weighs eight pounds (3.6 kilograms), flying 350 miles (560 kilometers) above Earth. These new missions mark the beginning of a new era in satellite technologies. Missions like those mentioned above may also pave the way for swarms of mini satellites to orbit around the moon, Mars and other objects in the solar system, Stofan said in the teleconference. And the initiative is making it easier than ever for space researchers outside of NASA to get involved in small satellite projects. Stofan said that the agency is "actively promoting the small spacecraft approach as a paradigm shift for NASA and the larger space community," through contracts with industry, NASA directive projects, collaborations with universities and partnerships with other space agencies.